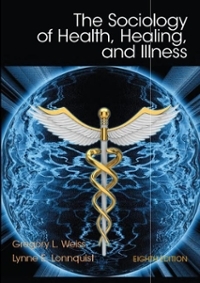 The Sociology of Health, Healing, and Illness 8 Edition A comprehensive presentation of the major topics in medical sociology. The Sociology of Health, Healing, and Illness, 8/e by Gregory L. Weiss and Lynne E. Lonnquist provides an in-depth overview of the field of medical sociology. The authors provide solid coverage of traditional topics while providing significant coverage of current issues related to health, healing, and illness. Readers will emerge with an understanding of the health care system in the United States as well as the changes that are taking place with the implementation of The Affordable Care Act.